"Our organization is known for its high standards in our business partnerships, and it is directly because of Digital Prospectors professionalism, dedication and positive attitude that they deliver at such a higher level than most of the other agencies we currently deal with on a daily basis." "It is a true pleasure working with Digital Prospectors. I would highly recommend them to any organization looking for a staffing partner. They always display a high level of professionalism and execution." "Our team is growing globally, yet the requirements for filling positions here has still remained intense and competitive. Where most agencies begin to fall away after submission of a few resumes, Digital Prospectors has consistently kept them coming and been patient when the ability to lend feedback might not avail itself." "Digital Prospectors is always the first, and most of the time, the only outside vendor I turn to when I have a need for contractors or help with a hard to fill perm opening. They understand our business and always send me quality candidates. I'd highly recommend their services to any company." "Digital Prospectors has been a reliable resource for our project. They were able to bring a highly skilled local resource to the table, which helped us achieve our project goals. Our resource was hardworking, reliable and an asset for our project." 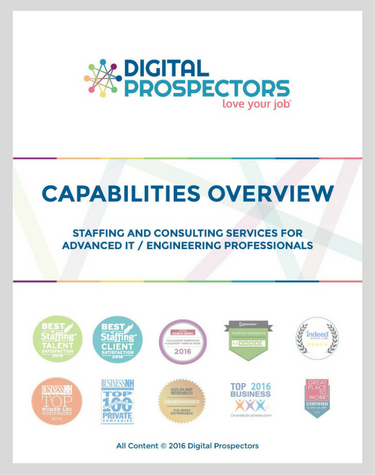 "Digital Prospectors has been on target with the required skills and experience for my IT needs. Their personnel, experience, and responsiveness have helped me meet my projects key goals and objectives." "Digital Prospectors responded immediately and was quick to get the ball rolling. By mid-week, I had a phone interview, and by the end of the week I had an in-person interview. They even maintained contact during the weekend. From start to finish, they kept me informed and involved and was clearly pulling for my success." "Digital Prospectors got to know our people and understand our company, and then presented a field of candidates with skills and experience perfectly aligned with our business needs. We found the right IT Manager, and we couldn't have done it without Digital Prospectors." "Digital Prospectors discussed my departmental needs, the type of person I was looking for and the timeframe therein, and Digital Prospectors presented several candidates that met the requirements in a timely manner. I appreciate the support I received from Digital Prospectors, and I look forward to working with them again in the future." "Have had a number of successes with candidates from Digital Prospectors. They always work hard to get us good resumes and people who are interested in working for us." "Always professional and candidates are top quality." "Digital Prospectors has been a value added service to our HIS consulting resource needs. Time and time again, they have provided highly skilled consultants. Digital Prospectors has been responsive, flexible and very professional to work with, and has been a provider to our organization for a number of years." "Excellent customer service and interaction with program manager. Digital Prospectors has been a great resource for our department!"